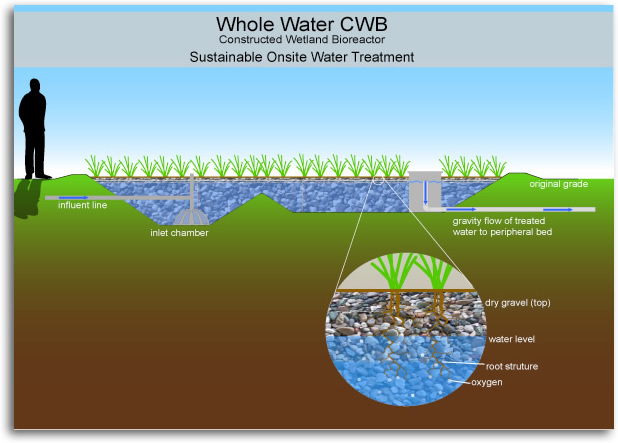 WHOLE WATER CWB, Constructed Wetland Bioreactor is an engineered system that makes use of naturally occurring biological processes to purify water. Its high performance makes it capable of reclaiming raw sewage into water clean enough for subsurface irrigation or discharge. This advanced degree of treatment is significantly different from traditional onsite septic disposal methods, yet it requires very similar maintenance as the treatment can be accomplished without the use of any chemicals or mechanical/energy input. The modular design concepts can be applied to every situation from an isolated single family home located in a pristine area, to clusters of homes or an entire city – wherever a modest amount of land is available and true value engineering is a priority to the users. With necessary pretreatment maintenance, filter cells offer the potential of virtually indefinite service life – a considerable improvement over conventional soil disposal fields. The typical CWB is installed outdoors adjacent to the home/business/facility of which the water effluent is being treated (illustrated to the right) We also offer custom designed systems that are mechanically identical to our in-ground systems with the major difference being that they can be tailored to fit their environment. Customized CWBs can take the form of a rooftop garden, planter boxes, living walls, or even green roofs. CWB is a shallow bed (about 1 meter depth) of coarse gravel, with a top layer of fine gravel. The top of the gravel is usually at the same elevation as the surrounding terrain. A shallow berm and impervious liner isolates the water within the system from contact with the surrounding surface run-off and groundwater. Patented inlet and outlet structures, together with the design of the basin, ensure uniform horizontal and vertical flow patterns through the gravel bed and thus harnessing the full potential of the entire filter. The outlet structure can be adjusted to set the water level wherever needed for system operation. The water level is normally maintained 6 to 10 cm below the top of the gravel. Since the top of the gravel is dry, no odor is produced, insects cannot breed, and there is no danger of accidental human contact with the water in the treatment process. The CWB is preceded by a tank or settling basin which provides the first stage treatment. This primary treatment removes the majority of heavy suspended solids and floating oil/grease materials. From the primary treatment, effluent flows into the CWB where the water is treated aerobically and anaerobically. The microbes performing most of the treatment functions prefer to live on a solid surface, rather than suspended in the water. The gravel provides this preferred environment at about 225 m 2 per m 3 of gravel. A greater microbe population provides greater and faster water treatment. Most plastic growth media, at a far greater cost, do not provide as much area per m 3. The microbial film grows to a certain thickness, and then stabilizes, so that it does not obstruct water flow. Selected local vegetation, evolved to thrive in wet conditions, is planted in the gravel. This provides an attractive cover. The plants assist water treatment by using waste components in building the plant tissues, and the deep roots of aquatic vegetation afford massive additional surface area for microbial attachment. These roots also carry oxygen and a wide variety of plant exudates, which invigorate the microbial system. Plants also provide a way to manage/remove materials from the water system by harvesting. The close interaction of microbes and plant roots provides a complex mixture of small zones, both with oxygen and without oxygen. The mixture of environments provides comprehensive treatment of the water, including removal of most of the nitrogen and BOD. Under nominal conditions, treated filter flows consistently meet high-quality irrigation suitability standards, (as allowable in your application). Subsurface discharges are isolated from human contact, thus eliminating the need for chlorine disinfection. The constructed wetland is far more durable than mechanical systems, allowing owners to meet discharge standards without the assistance of expensive, highly-skilled operators. The outflow structure is designed for easy sampling and monitoring, and for easy direction of water into any disposal or reuse plan. Many modifications are possible, to take advantage of local conditions, or to meet local challenges such as specific pollutants. Possible shapes are endless. Multiple cells can be used. Geothermal energy, or waste industrial heat, can be used. For space-restricted sites, even solar powered recirculation or aeration can be provided to decrease land area requirements. In small individual systems, the septic tank is vented through the building sewer system, so there is no odor problem. In larger systems, different plans can be used to eliminate odors, or to prevent them from ever being produced. In both residential and town-sized systems, solids will slowly accumulate. Solids in a typical residential system will need to be removed only every 2 to 5 years depending on use. Town systems can be provided with a first stage treatment that digests and eliminates most of the solids as they are generated. Other innovative processes are of interest for their small site footprint requirements.